My theological journey has been characterized by duality of passions. While I am passionate about Youth Ministry and engaging in the real life situations of teenagers and Youth Workers, I am equally passionate about academic theology--particularly what I tend to refer to as "political theology" (which can include, by my broad definition; liberation theology, feminist theology, and folks like Hauerwas, Cavanaugh, and Moltmann). I rarely discover a good opportunity to bridge these passions. Youth Ministry is usually treated as kid's stuff by the big minds of academic theological reflection and such theology is foreign territory to most of the Youth Ministry practitioners with whom I've interacted. As such, I tend to feel out of place in either setting--in Youth Ministry or in academic theology. I know that there are bridges between the two worlds (I'm thinking of everything by Andrew Root and Kenda Creasy Dean as well as Toward a Prophetic Youth Ministry by Fernando Arzola Jr.) but they're difficult to find and the church is in need for such bridges to be more accessible. 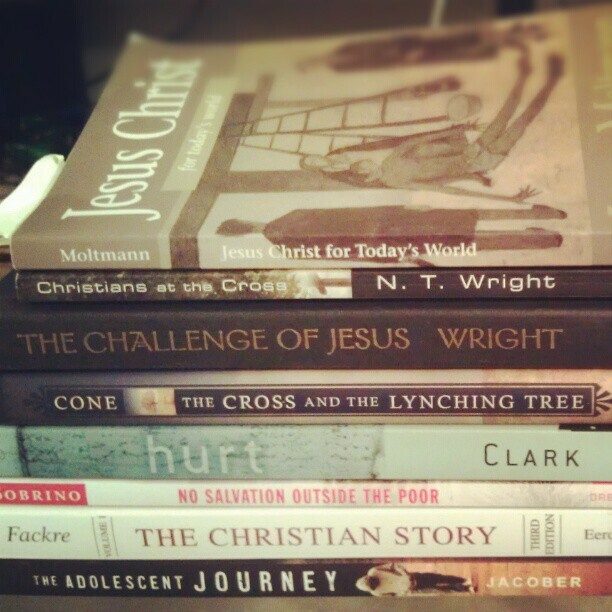 I'm planning on writing a theology of Atonement for Youth Ministry, most heavily leaning on Jurgen Moltmann's Christology. As some Youth Ministry thinkers have pointed out--not least Chap Clark of Fuller Theological Seminary--a developmentally characteristic cultural issue with which teenagers are currently dealing is that of "systemic abandonment." Well, it is precisely from a vantage point of abandonment that Jurgen Moltmann begins his Christological reflection. "I felt abandoned by God and human beings, and the hopes of my youth died," writes Moltmann. "...Then I was drawn to the story of the passion, and when I came to Jesus' death cry I knew: this is the one who understands you and is beside you when everyone else abandons you." It was out of this embrace of God in his darkest place, an embrace characterized by Christ on the cross, that Moltmann became "possessed by a hope." The cross for Moltmann is not only the place where God deals with the sins of the world, it is also, if not primarily, the place where God embraces the crucified people and gives companionship to the abandoned by entering into solidarity with them in their suffering. It is thereby that God saves God's people from both sin and victimization--God brings Atonement by shining light in the darkness, by being hope in the midst of hopelessness. From this theological starting point, we can begin to conceive of cross-shaped Youth Ministries--ministries marked not by their ability to reach the "popular kinds" who might be good at inviting their friends to youth group, but the abandoned ones first. "Vibrant" Youth Ministries, if they're shaped by the Atonement, will be ministries which embrace the unwanted--where there is freedom to doubt, freedom to suffer, and freedom to honestly invite God into the darkest places of the soul. Youth Ministry that is shaped by God's embodied 'Yes' to crucified people is ministry which pronounces dignity to shame and is thus shameless, even on the cross. Too many ministries have created space where the values of "success" and "spirituality" are so elevated, there is so great an air of such things, that darkness and abandonment are provided no dignity. Those who do not "have it all together" are made to feel unwelcome if they cannot do something to hide their darkness, thus the systemic abandonment is perpetuated even as the gospel is preached. But a Christology of atoning embrace can serve as the anti-abandonment, the hope birthed in hopelessness. The church's ministry to youth has the opportunity to announce God's presence on the cross, God's solidarity with crucified people, and thus point to the bridge from abandonment to embrace. I'm also gonna be referring to theologians like James Cone, Jon Sobrino, and even N.T. Wright in my formulation. Stuff like this is why I'm here at Princeton in the first place. The Moltmann Quotes in this post are from his 1994 edition of Jesus Christ for Today's World (pages 2-3).